Minister Takeshita meets with Ambassador Kennedy and Vice Adm.Aucoin, commander of 7th Fleet. 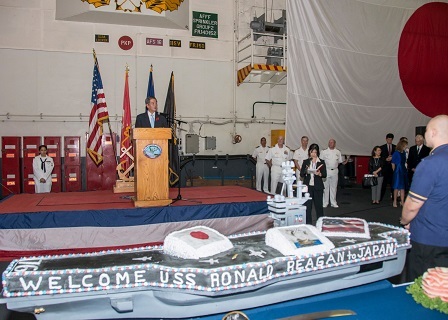 On October 2, 2015, Minister Takeshita attended a welcome reception for USS Ronald Reagan in Yokosuka. In his speech, the Minister extended appreciation for all the people who participated in the Operation Tomodachi, including search and rescue operation and transportation of goods for humanitarian assistance. Minister Takeshita also talked about the current situation of the reconstruction in Tohoku, and expressed the determination to achieve the reconstruction works. Ambassador Kennedy and Vice Adm. Aucoin, commander of 7th Fleet, welcomed the Minister’s appearance to the event. *Minister Takeshita’s speech is available here.